Big thanks to Maureen Hickey and her hard working team for running another fabulous annual Monster Cake Sale in June. 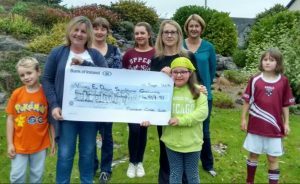 All the hours of baking, decorating and selling yummy cakes and treats, along with running a coffee shop and a raffle raised the amazing sum of €4917.91 for VFDSG. Well done to all involved and big thanks to all who supported…raising lots of “dough” for our charity!